3-D printing is going to put humans out of work and make shopping obsolete, if you believe the evangelists. 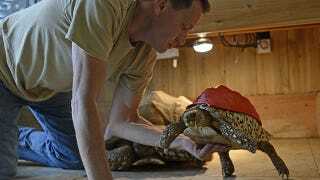 But before it does all of that, it has poor sickly animals to save, like Cleopatra the tortoise. Backstory: Cleopatra had a poor diet, and as a result, a shell that was misshapen, full of valleys and ridges. This meant that when she played with her tortoise friends, her shell became worn, and eventually, holes appeared, making her vulnerable to infection. The solution was to 3-D print her a protective shell out of fetching red plastic, which sits on top of her crappy non-3-D-printed normal shell, and protects her at playtime. She's expected to heal within the next few years, and will eventually grow out of her shell and be like all the rest of the tortoises.